New Porsche Boxster and Cayman revealed | What Car? The first official images have been released of the new Porsche Boxster and Cayman, both of which are powered by new more powerful, but cleaner engines. The 3.4-litre petrol engine in 'S' models now has 310bhp in the Boxster S and 320bhp in the Cayman S, up 15bhp and 25bhp respectively. 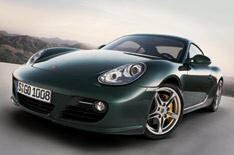 Both cars are available with Porsche's superfast and fuel-efficient double clutch gearbox. The system is called PDK and is operated via buttons on the steering wheel. Both the Boxster and Cayman will average 32.0mpg when powered by the 2.9-litre engine and using PDK, which is 11% more efficient than the former models fitted with the Tiptronic S semi-automatic gearchange. Powered by the 3.4-litre engine and using PDK, the cars average 31mpg, which is 16% more efficient than before. Styling changes are subtle, and include new halogen headlamps with integrated indicators and new LED rear lights. The suspension has also been tweaked to improve the ride and handling, while the braking system now has a safety feature that pre-loads the brakes if the driver lifts off the accelerator suddenly, as in an accident situation. S models have larger brakes and slightly wider wheels than before. An uprated stereo system with MP3 compatibility is also fitted as standard. Both are also available with an optional lights package, which adds bi-xenon headlights, a system that moves the light beam as you corner and LED daytime-running lights. A heated seat system is also available. A launch control system is available, and shaves 0.2s off the 0-62mph times. The new models are between 650 and 1255 more than the old ones, but all drivers will receive a day's driving tuition at Porsche's new training facility at Silverstone.